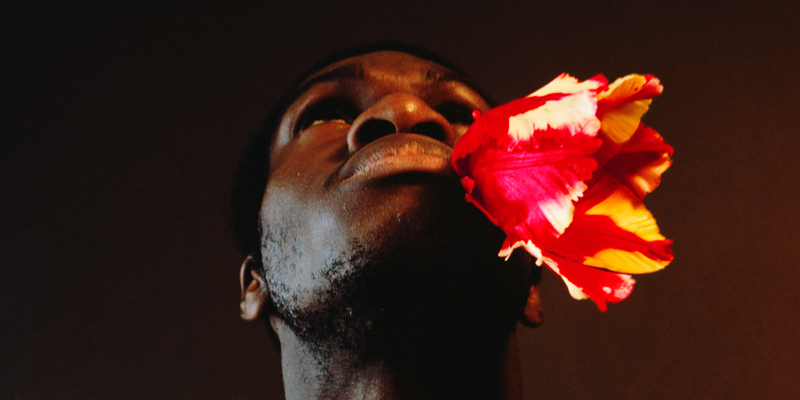 Rotimi Fani-Kayode, Tulip Boy II, 1989. Rotimi Fani-Kayode, the protean “contemporary Yoruban artist,” is known for his photographs—approximately one hundred of them, taken over a mere six years—investigating queerness and the African diaspora. Born in Nigeria, he traveled to Washington, DC, New York, and London, where he participated in the sexual and punk subcultures of the 1980s before his death in 1989 at the age of thirty-four from AIDS-related complications. Here, Grant Johnson talks about the artist with Ian Bourland, whose Bloodflowers: Rotimi Fani-Kayode, Photography, and the 1980s is the first monograph dedicated to the photographer. GRANT JOHNSON: What sparked this project? IAN BOURLAND: It came out of my dissertation work originally, which was about British artists, mostly in the 1990s, during this multicultural moment after the heyday of the black British art movement. Around 2007, the first and second waves of contemporary African art history had come to pass, led by people like the late Okwui Enwezor, and Rotimi Fani-Kayode’s name came up again and again. Steven Nelson had written a beautiful article; Kobena Mercer, who was his contemporary in London in the ’80s, had written about his work in a more critical guise. But there hadn’t been a full study, and given the caliber of his images and his resonance with so many audiences, I wondered why no one had written a monograph. GJ: I’m curious about how you mobilize Fani-Kayode’s work as a lens through which to study other photographic practices of the 1980s. IB: That’s the core of the book. He described himself as a “contemporary Yoruban artist” when there was really no rubric for even thinking about contemporary African art. Of course, there were and are many African modernisms, and a lot of curatorial work is showing that more and more. But he was idiosyncratic and iconoclastic. He saw himself as an African artist who, for many reasons, couldn’t go back to Africa. He was the son of a prominent family that fled the Nigerian civil war. He studied at Pratt Institute in New York and at Georgetown University in Washington, DC. The first place many people encountered his work was in a 1996 show at the Solomon R. Guggenheim Museum, titled “In/sight: African Photographers, 1940 to the Present.” He has had an afterlife in the discourses of contemporary African art and diasporic studies. When I started writing in 2008—in Chicago—Barack Obama had just won the election. There was a sense in some quarters of the academy that things were actually improving, and that it would be worthwhile to think about the strictly art historical maybe over and against the social. In retrospect, of course, that feels tremendously naive. But there are so many art-historical resonances. You can look at Fani-Kayode’s photographs through the lens of Baroque painting or Surrealism. Although his work is deeply idiosyncratic and singular, he cuts an intersectional figure avant la lettre. He died the same year that Kimberlé Crenshaw drafted her article introducing the idea of intersectionality. Fani-Kayode was also a forerunner to an idea of queerness that again was being theorized actively just around the time that he died. He came out of the liberation moment in both London and New York, and his practice was deeply responsive to the social upheavals of ’80s Britain. Xenophobia and homophobia were active forces that shaped his work and life. Fast-forward thirty years after his death, and we’re witnessing the rise of right-wing parties, of Brexit. It’s a different cultural moment, but the issues he attended to are obviously pressing again. GJ: Dare I say it’s a bit bold to make him the solo figure of a book? You point to George Baker’s idea of the anti-monograph. I thought also of Branden Joseph’s sprawling work on Tony Conrad and of Carrie Lambert-Beatty’s book on Yvonne Rainer—whom she conceives of, similarly, as self-consciously mediated and mediating. IB: There’s been a lot of discussion about Enwezor in the past few days. One thing he said, and I’m paraphrasing, is that African artists don’t have to ask permission to be part of the world. They are part of the world. A lot of the work that’s been done on diasporic artists has been brilliant, but there is little scholarship at the level of the monographic. There have been a few books on African artists, but this is the first scholarly monograph on an African photographer. I mean, why doesn’t he deserve it? Why do we have monographic studies on all these other folks in Europe and the United States? So it is bold, but I think the work warrants it, full stop. Fani-Kayode himself was resistant to this idea of the monographic or heroic figure. Much of his project was, in a humorous and subtle way, to subvert identity and to undermine the fetishization of the body or celebrity that we see in the work of his peers in the ’80s. As the subtitle suggests, part of my project was also to form a broader cultural history of the ’80s in England, a moment of resistance against neoliberal policies of repression and censorship. We love the ’70s, we love the post-’89 period, but the ’80s have been overlooked. I hope this is an opening salvo for many new histories of that era. There was a lot of trauma in the ’80s, which I think is part of the reason why we see a return to Surrealism and a fascination with the psychoanalytic again at that time—as safe ways for the modernist to come to terms with and sort through some of that trauma. Fani-Kayode came at it from what Henry Louis Gates Jr. would call a perpendicular angle, bringing in elements from Yorubaland in Nigeria and modes of healing and knowledge that are intrinsic to American identity through the African diaspora and the legacy of chattel slavery. GJ: He adapts another thread, a romantic or baroque classicism, which we see elsewhere in the ’80s, in the religiosity or grand seriousness of Robert Mapplethorpe or even late Andy Warhol. I have a knee-jerk reaction to that romanticism, rejecting it as retrograde, but I’m willing to admit this might be a misguided impulse. How was it operative for Fani-Kayode? IB: This return to Surrealism also comes out of romanticism, which is easy to write off as retrograde or nostalgic, as a kind of depoliticized self-absorption. But what’s wrong with romance? Fani-Kayode saw the world as a disenchanted, incredibly dark place. He says, “Look, the pharmaceutical companies aren’t giving us the drugs for HIV and AIDS. They’re evil corporations.” He says, “Wall Street banks are killing us,” and he is deeply anti-capitalist and anti-corporatist. He’s a migrant where he’s not wanted, and people around him are dying. I invoke Paul Gilroy a few times and posit negative dialectics. When the grand project is dead, what’s left? There are moments of personal liberation or transgression. I think Fani-Kayode finds a really fruitful trajectory there. It’s also just the cultural milieu in which he’s found. I devote a whole chapter to this New Romantic moment, the Blitz Kids in London, the late ’70s and early ’80s youth culture. He comes out of this cultural studies period where youth culture is reshaping British intellectual history and the academy. You’ve got these countercultural moments of transgression, which are very much in-line with the loft parties or discos of the ’70s, house music, early rave culture, and various other forms of what José Muñoz identified as utopian queer futurity. Those are powerful forces that we overlook at our peril. This New Romantic vibe that comes out in his pictures is also looking laterally to Derek Jarman, who had a huge influence on Fani-Kayode. It’s a politics of appropriation and camp, a reactivation of an alternate lineage that we might call explicitly queer, from Caravaggio to Walter Pater and Oscar Wilde, that Victorian moment in which their asymmetry is also a romantic nostalgia, which is brought all the way forward to the ’80s. GJ: Now that the book is on the shelf, are there photographs where there’s still more to say—that are still haunting you, so to speak? IB: There are two sets of works from 1988 and ’89, when Fani-Kayode had a little more money, a little more space. He had moved to higher quality film stock and color photography, and began making chromogenic prints. He also studied alternate processes and was using gum bichromate—that’s explicitly Victorian. There are two works that came out of that moment. One is a series called “Abiku,” which is Yoruban for “born to die.” For it, Fani-Kayode used hand-tinting and alternate processes to create an underwater feeling, and he’s wearing what looks like surgical tubing, an umbilical cord choking him. There’s an amniotic aspect to it, but also a drowning and lynching element. At the same time, he was making works in the vein of the one on the cover of the book, Tulip Boy II from 1989. It resembles Kate Bush’s album cover for The Sensual World, released that same year. I think they were both looking at Yukio Mishima, the writer-bodybuilder who committed ritual suicide. He was a nationalist and didn’t want his body to deteriorate before he died. Like him, Fani-Kayode had a sense of impending mortality from an early age and always had this specter of death looming over him. I think there’s still a story to be told between those images and attitudes toward death and ritual. Ian Bourland’s Bloodflowers: Rotimi Fani-Kayode, Photography, and the 1980s is published by Duke University Press.